An eCommerce landing page design is your opportunity to make a positive and effective impression in front of your website visitor and convert them into returning customers. Showcase your products and sell them using our beautifully designed landing pages. Our professionally designed converting eCommerce landing page design deliver a clear message to the visitor about the main purpose of landing page design and gives your product a beautiful visual look. At the time of designing a landing page we keep in mind the purpose of the landing page and current market trends to make the landing page visually appealing and high converting by using relevant tagline and stock photo. Boost your eCommerce business sales with our conversion centered professional eCommerce landing page design. 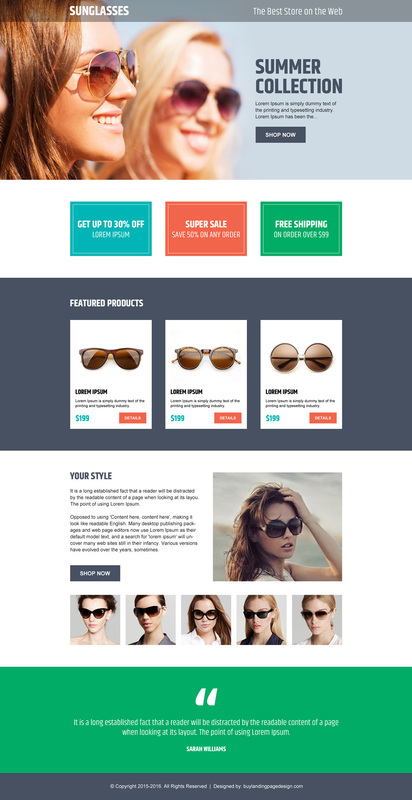 Below is an examples of online sun-glass store eCommerce landing page design to increase conversion rate for your business marketing campaign. online store call to action landing page design at a very reasonable and affordable price from buy landing page design to increase leads, sales and conversion for your business marketing.